For my second subwoofer, I wanted a smaller box with no port noise, a higher output, a lower cutoff frequency and a better standard of finish. Switching to the Jaycar driver with a lower Vas and fs, cut the box size from 90 litres to 65 litres. The enclosure was veneered in blackwood with redwood top and bottom. Originally fitted with 50mm internal ports, this enclosure looked quite good. Port noise forced the move to larger external ports, and the controversial looking Sidewinder was born! 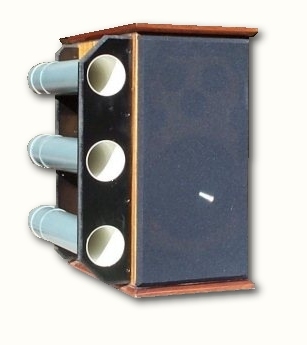 Originally this speaker had three 50mm internal ports and the noise was atrocious. By this time, a later version of WinISD was available, which graphs vent air velocity and recommends that the peak not exceed 17 m/sec. Blanking of the original ports and moving up to three 90mm ports gets this figure to below 10 m/sec. Cone excursion was going to be excessive below the vent's resonant frequency and so a separate Linkwitz-Riley Active filter was used.